Cheese Ravioli with Lemon Basil Butter Sauce-this fresh and tasty recipe takes less than 30 minutes to make and is always a hit! We are always trying to come up with quick and easy dinner recipes. We love sitting down at the dinner table as a family, but sometimes it is hard. We are busy and we know you all are too! That is why we like to have some ” go to” dinner recipes up our sleeves that take less than 30 minutes to make. 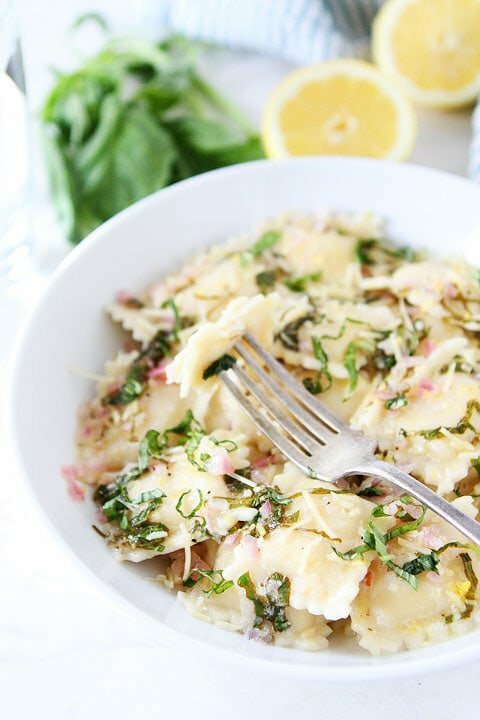 Our new favorite quick and easy recipe is Cheese Ravioli with Lemon Basil Butter Sauce. You can have this simple dish on your table in under 30 minutes. And the best part? 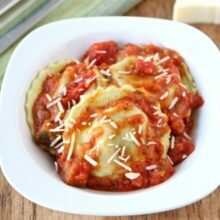 You will feel like you are eating at a gourmet restaurant because this ravioli is amazing! And I promise you, once you pour the lemon basil butter sauce over the ravioli, it will taste homemade. The sauce is the star in this dish! To make the lemon basil butter sauce, we used two Land O Lakes® Butter with Olive Oil & Sea Salt Half Sticks. We love using half sticks because they are individually wrapped to keep the butter tasting fresher longer. We drizzled the lemon basil butter sauce over the cheese ravioli and sprinkled fresh Parmesan cheese and a little more basil for garnish. The flavors are light and refreshing, which makes this recipe perfect for summertime! 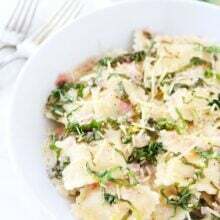 We are going to plant a ton of basil in our raised herb garden so I know we will be making Cheese Ravioli with Lemon Basil Butter Sauce all summer long! It’s a winner! The lemon basil butter sauce will knock your socks off! And the best part? You can have this dish on your dinner table in less than 30 minutes! Bring a large pot of water to boil. Add a pinch of salt and cook ravioli according to package instructions. Drain and set aside. 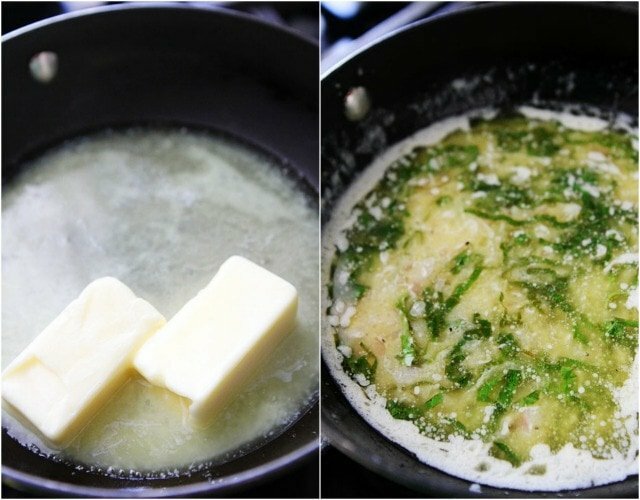 While the ravioli is cooking, make the butter sauce. In a small saucepan, melt the butter over medium heat. Add the shallot and cook until tender, about two minutes. Stir in the lemon zest, lemon juice, and basil. Cook for an additional 2 minutes. Season with salt and pepper, to taste. Pour the ravioli in a serving bowl. Pour lemon basil butter sauce over the ravioli and stir gently to combine. Garnish with Parmesan cheese and extra basil, if desired. Serve immediately. 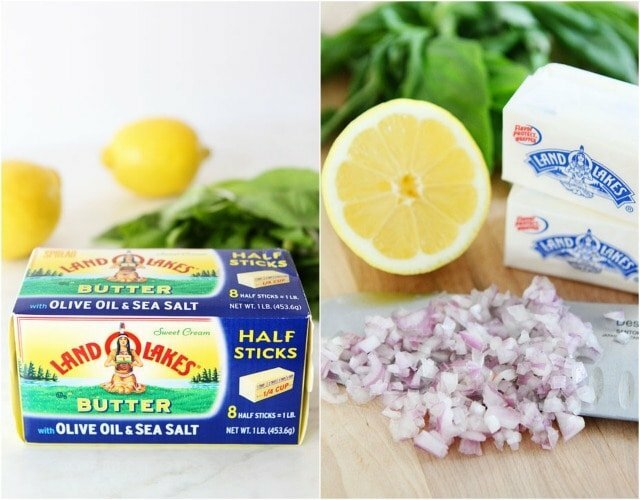 Two Peas and Their Pod has partnered with Land O’Lakes for an exclusive endorsement of Land O Lakes® Butter for their Kitchen Conversations blogger program. This blog post is sponsored by Land O’Lakes. Delicious! This butter sauce is fabulous. I have NEVER seen that olive oil/sea salt butter – I MUST find it! This simple dinner sounds so elegant, and I LOVE that I can have that on a weeknight! Pinned! That sauuuuuce! This looks so yummy! Ok, I know for you cooks, this doesn’t seem like a compliment, but this recipe looks like something I’d order from the Olive Garden! I mean, lemon butter basil sauce, oh yes, seconds please!!!! Love a quick, go to meal! 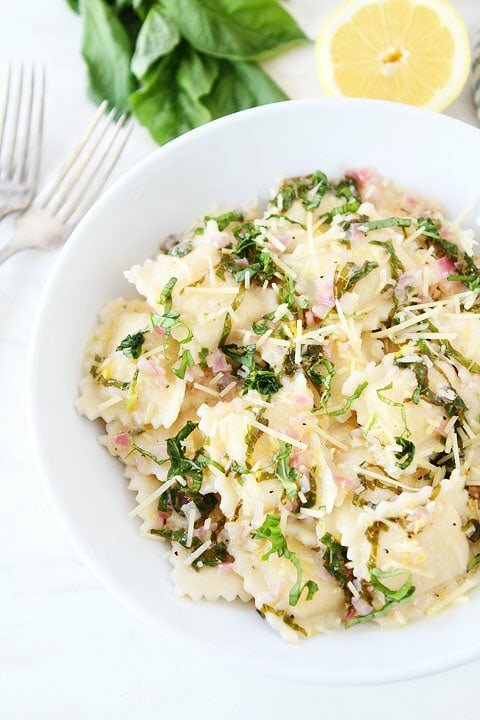 We have tons of basil to use right now, so this would be perfect! I’ve never seen this butter but I need it! 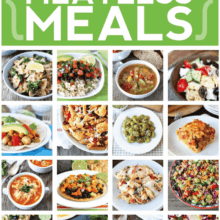 This looks like the perfect meatless Monday dinner! Easy dinners are my life!! Love this and that sauce sounds so fabulous! Love the sound of that lemon basil butter sauce- I think it would be amazing on so many things! I love quickly this comes together! This was such a tasty dish, Maria. Our kids love ravioli, and I know they’d really like this sauce. I’m happy to hear how easy it is to make! Looks so tasty! I love how easy it is to come together! Did someone say buttah?!!! Love these flavors! I am totally making this for my boys. SO good! Thinking about you…hope you have safe travels this week! What a perfectly simple dish to celebrate the flavors of summer! This is so beautiful Maria!! Looks delicious! 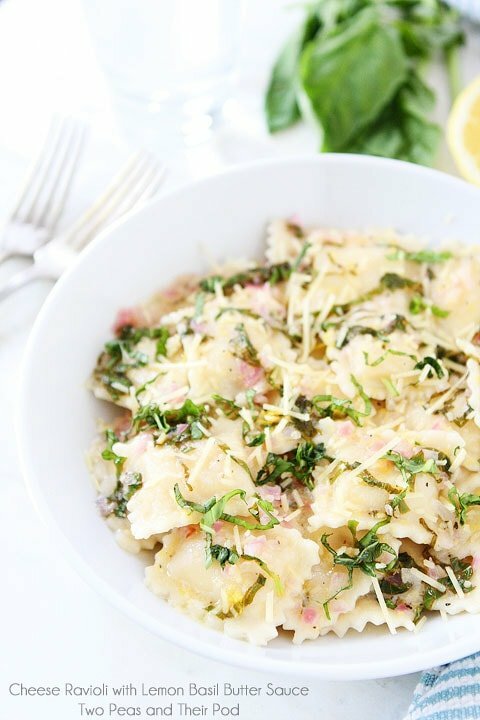 I really love the combo of lemon and basil! So good, Maria!! it was great seeing you and baking with you last week!!! 🙂 Have fun in Austin this week! Lemon butter sauce is a weakness of mine! 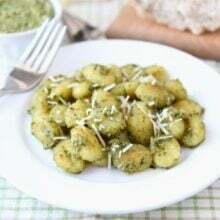 I love that you combined it with basil and put it on top of ravioli, another favorite of mine. Pinned! Good GOSH that is lovely. I can see what this is your new favorite quick and easy recipe. This is would be a great dish if you were having someone over for dinner, after you worked all day. Perfect. Of the course it’s the sauce that makes it special. This sounds seriously good. You can’t beat a 30 minute dinner, especially when it looks like that! The lemon basil butter sauce sounds divine! What a perfect dish for a summer supper! Absolutely love the flavors in this. Yum! OMG – I am going to do that with my purple basil! 🙂 Looks AMAZING. Love these flavors and the butter sauce sounds over the top! Lovely to look at and easy to make, the best combination! Made this tonight using cheese tortellini. My husband and I loved it! Thank you for always posting delicious recipes. I prepare and love more recipes from your blog than any other. Just made this for dinner, it was so good and fast to make. Thank you! Always love the recipes here! I made this last week and my family devoured it! SO good!!! This was so very good and so easy to make! Thanks so much for the recipe. I’ll be making it again soon! Delicious and so easy! Even though the lemon wasn’t “fresh” and red onion had to sub for shallots, this is a definite do over for our dinners! I tossed crumbled Italian sausage and tortellini in with this sauce and it was light and delicious. The lemon really compliments the dish. Thanks! I’m making this tonight with store bought frozen ravioli. I’m going to change this recipe just a tidge. 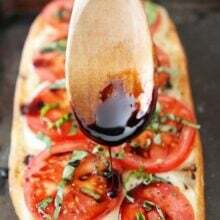 I’ve learned how to make brown butter so I will brown the butter, then add some parm and white wine into the sauce with the basil and maybe a teaspoon or two of minced garlic that comes in a tube. Wish I had some frozen, organic peas to add, but have fresh lemon and zest that I’m sure will add that brightness. I’ll come back after dinner and let you know if the brown butter is worth the time and extra butter it takes to make the correct amount of brown butter to start the side building. This recipe is awesome. Hopefully will be able to figure out how to follow this site. So easy to prepare and absolutely delicious. Adding to my recepie book. Thanks for sharing. I can’t find this butter in stick form, but I can find it in the tub. The sauce makes the dish. It’s restaurant quality and looks amazing. I use spinach and cheese ravioli and tend to make extra sauce if I make chicken cutlets on the side. Love it!! Have made quite a few times. went really well with the dish I made . would recommend the sauce.